Need some advice on embedded dashboards. I am trying to access dashboard which having a customer category filter. Data is correctly filtered based on the input, but user can see the filter box. which I want to hide. I tried same, but it still showing filter in the 0.32.2 version. In preview its disabled, but when accessing via iframe its showing up. Sorry, it should be Locked, not Disabled. I think the problem is that you’re trying to use public dashboard instead of embedded dashboard. Your link is /public/dashboard/UUID?filter=value, so that’s just a regular public dashboard, which currently doesn’t allow any customization. 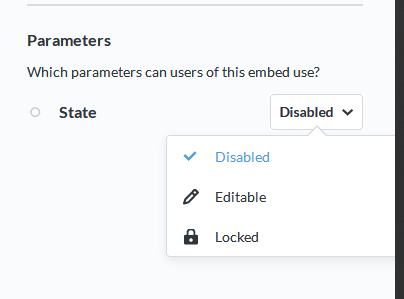 You should look at embedding to have more control of functionality and looks.